His name was Milarepa and he was a murderer. The start of this yogi’s life was marred by violence, hatred and revenge. But mention his name to any Tibetan and their eyes will well up with tears of devotion and joy. For this is a story about change. This is a man who recognized his flaws and mistakes and turned his life around. This is a man who became the greatest yogi the world has ever seen. Milarepa was born into a wealthy family in the snowy land of Tibet in 1052. Early on in his teenage years his father passed away and, with no one left to control the estate, his aunt and uncle stole his entire inheritance. Filled with rage and hatred the young Milarepa went away to learn various dark arts and soon returned to murder them. In fact, it is said that the vengeful Milarepa was so angry that he killed 35 people in his uncle’s village on the night of the revenge. Soon after these dreadful events Milarepa’s life started to fall to pieces. He had reached an extremely dark place and realized very deeply that his life had turned out all wrong. He was ashamed of who had become and what he had done to his family. He realized the grave mistake he had made. So he set out to make things right. On his quest of redemption Milarepa met a man named Marpa who had brought all of the Buddhist teachings to Tibet from India. Marpa had endured great hardships to bring these teachings back and it is said that without Marpa the Buddhist teachings would not have survived in the land of snows. The moment Milarepa first saw Marpa was magic. Legend tells us that Marpa was out in a field having a drink and Milarepa passed him on the road. When his eyes first fell on Marpa the whole world stood still and the hairs on the back of his neck stood on end. 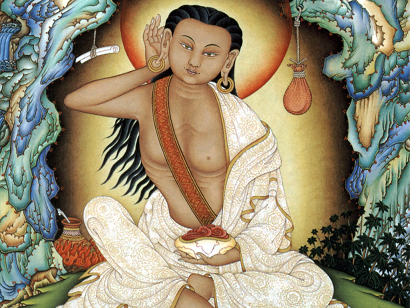 Milarepa had no idea who the man was but due to their strong connection from past lives it is said that Milarepa experienced a deep state of meditation by just looking at Marpa. “Build me a large tower and I will teach you the Dharma,” he said. So Milarepa set to work. He gathered stones and rocks and wood from all over the country side. After many weeks of backbreaking labor Milarepa went back to Marpa and told him the tower was complete. Marpa went to inspect the work and upon seeing it started yelling at Milarepa telling him that he had done it all wrong and that he needed to start again! This went on nine more times. 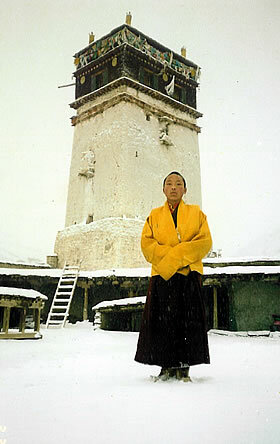 The last tower Milarepa built was nine stories high and took many months to complete. Remember, this was before cars, cranes and cement mixers. It took such a toll on his body it is said that he had open sores all over his back and that he was now a hunch back from carrying all the rocks. But he did it. And his dedication to Marpa never wavered. He wanted the teachings so much. After the last tower was built Milarepa stumbled back to Marpa’s house where the teacher was giving some advanced teachings to some other yogis. Milarepa fell on the floor by Marpa’s feet and begged for teachings. But, as always, Marpa told him to go away. Completely at his wit’s end Milarepa decided to kill himself. He had murdered 35 people and without the teachings of the Buddha he felt there was no way he could make things right and no way to benefit those dead people. So he hung a rope on a tree and put it around his neck. He took a deep breath and braced himself and just as he was about to step to his death Marpa approached and said that he was now ready to receive the highest teachings of Buddhism. Marpa had accepted him as a disciple. It is said that Marpa put him through all of these hardships to help him purify his negative karma and to make him a suitable vessel for the teachings. Without those hardships Milarepa’s mind would not have been prepared and he would have made no progress due to the severity of his past actions. Marpa’s foresight had allowed him to see how the back breaking work would benefit the new yogi and help him to make quick progress. Milarepa then received all of Marpa’s teachings. One night during a very secret teaching Marpa had a dream where a beautiful female Buddha told him that Milarepa would become the holder of his lineage and to therefore teach him well. Thus, Marpa taught Milarepa everything he had learned in India, like one pot pouring water into another pot. Once the yogi was fully trained he said his goodbyes and set off into the wilderness. He took a vow to stay alone in the caves until he achieved enlightenment and he never broke this vow. Milarepa would sometimes brick up the entrance of his cave so that he could not leave and meditate in there for years, food and drink being passed to him through a crack in the bricks. The Buddhist teachings say that it is possible for someone to attain enlightenment in one lifetime but that it is extremely rare. For most Buddhist practitioners it will take many many lifetimes to accumulate the wisdom and compassion that is needed. But Milarepa did it. He is renowned as the only person in Tibetan history to have attained complete enlightenment in one body, one life time. And that is why he is the greatest yogi of all. Milarepa was known as a great poet. He would often roam around the countryside singing songs and writing poems for the local people. I would like to share with you some of Milarepa’s most famous poems, teachings and quotes in the hope that it might benefit someone out there. Milarepa was known to be very humble. He would wear nothing but a few dirty old rags and he would never sit on a high throne or seat. He had no fancy monastery but instead chose to dwell in caves and on mountains. Many of his songs are about humility. Milarepa often talks about how humility allows us to develop compassion and love whereas arrogance causes us to feel better and more important than everyone else. He often scolded local people for being arrogant saying that pride is the cause suffering because it is so self-centered. And when you are arrogant and proud and things don’t go your way, you suffer. One of the key themes in Milarepa’s poems and songs is death. It seems as though his past as a murderer stayed with him and he was always mindful of the fact that death could come at any time. But Milarepa used this knowledge as inspiration, not as a cause for depression. Instead of worrying about death he faced his fears and used his mortality as his primary motivation to practice hard. I often try to encourage my readers to do the same. We have no idea when we are going to die but we know that death is a certainty. So we should use this precious opportunity to achieve our goals and do some good. That is what Milarepa did. He made the most of his time by being constantly aware of the fact that time could run out. One thing that I wish my parents spent more time educating me on is the truth of impermanence. It is a very useful thing to understand but one which most people, sadly, never really grasp. Milarepa often told people not to bee too attached to things because it wouldn’t last. Relationships, wealth, jobs, houses, countries, etc. All of it will fade like a rainbow. None of it will last forever. And by understanding and respecting this truth one is able to enjoy life a lot more. Our relationships to the world become more realistic and healthy. We are not always grasping at things trying to prevent them from ending. When we understand impermanence we are more likely to appreciate something while it is here. I love this quote. In fact, I have it as my desktop background and I read it when I need to remind myself that there is something else to do other than work, eat, sleep and work. We can all identify with this saying, even if we aren’t meditation practitioners. The affairs of the world will go on forever. There will always be someone or something getting in the way of our hopes and dreams. It might be work or money or some other obstacle but as soon as you overcome it, a new one will appear. Milarepa is telling us not to waste time but to get on with it. There are always going to be distractions and problems but we need to make progress anyway. This is very important. “My religion is not Buddhism. My religion is to live and die without regret.” – Milarepa. This is my favorite quote of all time. Not just of Milarepa, but of anyone, anywhere. I read it and I feel inspired to be a better man and to do everything I can to make my life beneficial and worthwhile. I love it because it hits to the heart of the matter and expresses how horrible it would be to be on death’s door and have regrets about things you have done (or not done!) during your youth. If you are interested in learning more about this great yogi I highly encourage you to read the famous book called The Hundred Thousand Songs of Milarepa. This is my all time favorite book. It is a majestic collection of all of Milarepa’s songs and poems and teachings. It is an extremely pithy read. Sometimes he sings about what it is like living inside a cave and you really feel like you are right there next to him. Other times he sings about how his compassion burns inside him like a fire and you get a sense of what it must be like to experience true love. All in all it is an amazing read. This book has been in every household in Tibet for hundreds of years. It is read to children at a young age and then studied in the monasteries by the monks. You would be hard pressed to find a single Tibetan who cannot recite at least one of Milarepa’s poems off by heart. This post could have gone on forever. Milarepa’s life story can teach us so much about who we are and what we can become. Most of all, however, it shows us that we all have the potential to change our lives and our own situations. We are the masters of our own destiny. How wonderful to read what you share here! Deep bow to Saint Milarepa! It was only earlier this year that I read his astonishing biography. Have you seen the film? http://milarepamovie.com/ It is the first of two being made about is life and there is another DVD of his teachings also. Thanks again to another great post. Your words always motivate me to better myself. Thanks for the inspiration! No I haven’t seen the movie yet but I have heard some good things. Other people say it is a little sad because it only covers the first part of Milarepa’s life – before he meets Marpa. Thanks Kel. I am glad you enjoyed it. Well yes, it is the first of two films and if it does stop before he meets Marpa then there is still much more to come! Thank you for a very inspiring post. How wonderful to learn a little about this person/ saint. I will order the book you recommended right now! I certainly will! Great idea Puerhan. That’s great Miss Attica! I am sure you will enjoy it. Read the book Songs of Milarepa some 35 years ago to help me better understand one passage in “Stay With God” by Francis Brabazon. The Buddhist tradition has such great people in its past, I love to read about them. You talked about impermanence again, and its such an interesting phenomenon. Everything is impermanent of course, but I often wonder about the application of this knowledge to things like relationships. Its like a balancing act between realizing that relationships come and go, and then working to maintain them at the same time. Makes it difficult for one to stave off attachment, and yet care enough for a relationship, house, car, etc to maintain it in order to slow the march of impermanence down just a wee bit. If I accepted that my relationship with my wife, or the condition of my house, was something that would end whether I wanted it to or not, it might be tempting to just allow it all to crumble like a sculpture made of butter, and yet, you won’t live in a house long, or a marriage either without some will to keep impermanence at bay. Quite the paradox. I think that the life of a “lay buddhist” can be a bit more challenging in some respects than one of a monk who deliberately casts off many of these trappings that can cause attachment, and thus suffering. I have thought about that same thing a lot. It is very interesting. When I was first getting in to Buddhism I was a little “torn” about this teaching and its application to relationships but now I understand (I think!) that you just need to be aware of it. You don’t need to really do too much with it – just be aware that the relationship is impermanent and that will enrich your experience together. Impermanence will help you stave off attachment…even so far as to dissolve the most troublesome attachment..which is of course to the idea that you need to be in one. Yes, we all want to be……but we don’t need to be. When we recognize impermanence in ourselves then we move beyond attachment to another because truly, there is nothing we can attach to. We may use the presence of another in our life to shore up our emotions…..but in the end they cant do that…no one can. We must look at our basic anxiety…..which is connected ultimately to fear of death, whether we realize it or not. In the end, the great Tibetans and other teachers are simply pointing the way to our own experience. When we see the impermanence of what we call “I”..then we start to see that the solidity that we thought we saw in others was our own projection. When we see the ephemeral quality of our own personality , we gain the freedom to relate to that which is truly immortal in ourselves and in others. Fantastic comment Robert. Thank you for taking the time to write that. I hope to see you around the comments more often! Many thanks for allowing me to share a point or two with the mindful. We suffer largely because we have been conditioned to believe that certain things will bring us happiness. We pursue these things in the hope of neutralizing that subtle but nevertheless palpable unease in the center of ourselves. A sense that we cannot put our finger on. The feeling that we have all experienced is feedback from our magnificent being ;feedback to guide us toward SOURCE. Its a lack of conscious connection with source that so disturbs us. Its subtle, but powerful in its affect. So the great beings have left us with antidotes to this malady, and like all medicines , they may at first seem less palatable than the dis-ease. Very often the admonitions of the great beings strike us harsh, severe, and even heartless. Yet, if we persist in the work of releasing our attachment to things that cannot in themselves fulfill us in an ultimate sense, we gain the freedom to relate to that which is REAl. It seems somewhat paradoxical, but in learning not to cling to things which are inherently impermanent, we discover that which is not transient. Strangely enough, a very real and profound love for everything becomes alive in us. We discover our true nature and relate to creation from a new perspective. The great difficulty for human beings is that in order to do this successfully we must release that to which we have habitually held onto. What we hold onto causes us pain because it obscures that which would fulfill us. The great teachers are-in the end- giving us strategies to help with recognizing our habitual clinging to things which pass away. If we are using such things in our lives to assuage our inner agony , we only compound our problem. So, the master would say, Yes, have your relationship, but do it justice by giving it your utmost care and attention from moment to moment . Never allow yourself to come to your beloved with an expectation based on the past. Recognize the extent to which you (WE & US) project upon that other instead of becoming acutely aware of the being in our presence. Living in such a way, frees us from the resultant suffering brought by clinging , and opens us up to a new dimension of living;as well as freeing those we love in life from the burden of being responsible for our happiness. This is a profound blessing!. Many Thanks. I hope the typo and omission in that message didn’t add too much unclarity to what I was attempting to say. LOL. If I may add one thing about the great Milarepa…which may have even been said by someone in this very thread. Milarepa is the proof that no one is excluded from redemption. Further, he is proof that enlightened, transcendent beings are born of the muck of our world, and not beamed in from a seventh heaven. The birth place of sublime being hood is right here in our midst. Better men than I have said it, we are in a good place, that has all the potential to be the highest that we envision. Fantastic comment Robert. Thank you so much for taking the time to write that. This is what my dream for The Daily Mind was – to have a community of smart people helping each other. I am glad I found this site and the great comments from wise lay persons here. Most of the time we read the write up from monks but here we hearing from layperson contribution on how we can live in this materialistic world and yet be aware of the true nature of all phenomenon….impermanance ..(sankara). Well written comments from Robert and Mickey are especially helpful to laypeople who are sort of torn between attachment to material pursuit and the teaching in Buddhism about renounciation is the only way to true salvation. Career Change: How Do You Know When to Change Jobs?